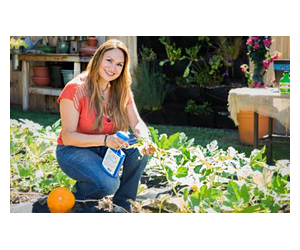 I invite you to watch my gardening segment on the Hallmark Channel show, "Home & Family" airing on Tuesday, Jan. 29, 2013 at 10AM EST. Have you ever wanted to make a "string garden" but didn't know how to do it? I'll be demonstrating the basics on the show and writing a step by step blog post later this week for you to enjoy. String gardens are "no-container" hanging plants and are also known as "kokedama" planting arragements. These unique hanging plants are expensive when bought but very inexpensive to make! Set your recorders for the "Home & Family" show, and if you like what you see, please post a comment on the Hallmark Channel discussion forum! Check your local listings for broadcast time in your area. The Home & Family show is a unique talk show centered on home and family topics! Hosts, Cristina Ferrare and Mark Steines welcome experts from every facet of lifestyle including cooking, crafts, design, gardening, relationships, celebrities, fashion and more! Let the producers know how much you appreciate seeing gardening segments on the show. Look for Home & Family on Facebook too! Thanks for your question. THere is a soil called, “akadema” which has the correct clay-like properties and is used in bonsai. I used clay soil from my yard and although never recommend soil from the yard, it works in this project. Make sure your soil is disease-free. I am in the process of learning how to make kokedama. I'm having a hard time finding the right soils, and on the show you say you used clay soil. Where did you get "clay soil"? Is it a brand? I want to demonstrate kokedama to my garden club in June. I think it's very neat looking!